Kismet or "The Enchanted Stepping Stones" by Leslie Melville. A wonderful book for performers of children's magic. 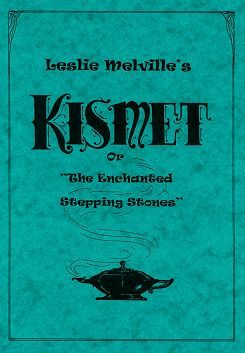 Kismet or "The Enchanted Stepping Stones"
This super publication by Leslie Melville contains five completely different 15/20 minute stage/platform routines, built around one easy to learn effect! *The Prizewinner - A Game of Chance! *The Treasure of Tortuga - A Pirate Tale! *Harry Potter and The Slimy Swamp of Sludge! *Arthur's Quest for the Dragon's Gold! *An Egyptian Night of Rapture - Wife-Swapping Among the Pyramids! Also included with the book is a gift of a 'Merlin's Purse' (A beautiful set of Buddha Papers) which can be used in the Arthur's Quest tale.